Dialogue - Have You Mastered This People Skill? One of the core people skills is the ability to engage in dialog. And it's in your interests to do so! To do your best, you need to have the best information. And yet, no one can be expected to know everything or have all the answers — not even the boss. No one person’s reasoning can be flawless all the time. While people may not always agree, you need the best thinking and the best answers you can get. So it helps if people are willing to share what they know and say what’s on their minds. In the best case, people are genuinely curious about each other’s views. If they keep an open mind, they can learn from each other and abandon less useful opinions for better ones. This kind of learning from each other is called “dialog.” But the process can be difficult, because you may have held certain ideas for a long time. Questioning one notion could mean questioning a whole set of related notions. These opinions could be wrapped up in your concept of who you are. You may find yourself feeling defensive when you find out that others have opinions that oppose your own. Dialogue is the free and creative examination of issues from several points of view. It’s a structured way of sharing each other’s thinking in order to make the best decisions and get the best results. Instead of defending your point of view, you openly consider whether there may be a more realistic, useful perspective. What's the best way to engage in dialog? For best results, everyone participating in dialogue should agree to keep an open mind—to temporarily set their assumptions and opinions aside. Everyone should be considered a colleague, so that people are heard with courtesy and respect. At least one person in the group should observe the process, so that members can be encouraged if necessary. The process consists of two aspects: advocating and inquiring. ADVOCATING – Stating your own opinion. Acknowledge that your opinion is simply an opinion. The all-important first step is to set aside the thought, “I know I’m right.” Your opinions are important, because they are the mental models upon which you base most of your decisions. But opinions aren’t final truths. Instead, they’re always tentative conclusions based on available facts and assumptions. Since everyone doesn’t share the same opinions, some of them may be founded on better facts and assumptions than others. Therefore, you stand to gain by considering the facts, assumptions and conclusions of others. State the assumptions upon which your opinion is based. Often an opinion is based on one or more conclusions. If you don’t have final proof of these conclusions, you’ll need to assume that they are true. Most people don’t realize that they’ve made these assumptions. To examine the strength of your opinion, state the assumptions you’ve made to establish your opinion. Explain your reasoning. While personal feelings, instinct and intuition can guide your decision-making, it’s important to ask whether your opinion makes sense. Is your opinion well supported by facts? Is your reasoning sound? Encourage others to examine your assumptions, facts and reasoning. To promote dialogue, invite others to inquire into your opinions. Ask them what they think about the opinions, assumptions, facts and reasoning you’ve shared. Give their evaluation serious consideration. INQUIRING—Asking about other people’s opinion. Ask about someone’s opinion only if you’re genuinely interested. Ask only if you’re truly curious and are open to the possibility of learning. It won’t be dialogue if you ask just to be polite or because it’s expected. Ask others about their opinions. Try to discover the opinions and attitudes that guide their thinking. Keep your mind open to the possibility that you may discover useful new ideas, concepts or answers. If you hear something you didn’t expect or something that conflicts with your own opinions, be on guard against your own defensiveness. Ask others about their assumptions. As you listen, check what you hear to make sure you understand. If you hear a basic concept that’s related to their line of thinking, ask them what this assumption is based on. You may be surprised how well-founded it is. Or you may discover that the assumption has serious flaws. Ask others about the facts upon which their opinion is based. When you hear an opinion, ask how the person came to that opinion. If they offer evidence, ask if they have more. Consider whether this is sufficient data from which to draw a conclusion. Ask others to explain their reasoning. As you listen to others make their points, you’ll pick up on the reasoning behind their arguments. Outline this reasoning to be sure you understood it correctly. Point out any strengths or weaknesses in the reasoning. 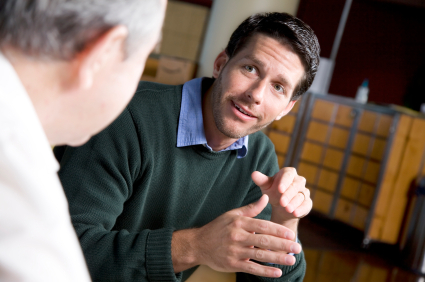 Dialog is an acquired skill, one that can help you expand your mind while becoming a masterful conversationalist. Stay tuned for more tips on this topic in a future post! Watch Meredith Bell's encouraging video on this topic! Just wishing you a great weekend, Denny. This is a highly evolved Universe maybe we could see in a movie! I was brought up this way, with a rational approach to fruitful dialogue. I only realized much later in life that most people misjudge dialogue for argument, and have no skills in this area. It is great to see them enumerated here, but it is not a fantasy life that exists in movies. Learned skills are simple to use once you understand the basics. You're a pretty instrumental part of my life. Thanks to twitter for bringing us closer. I really appreciate your work of personal development and want to especially thank you for touching any life that cares to read your thoughts!